FILE - Former Khmer Rouge S-21 prison chief Duch (C) greets the court during his appeal hearing at the Court Room of the Extraordinary Chambers in the Courts of Cambodia (ECCC) on the outskirts of Phnom Penh, Feb. 3, 2012. The head of an infamous Khmer Rouge security center and execution site confessed earlier this month to overseeing the fatal burning of four Western inmates in the 1970s. During his second day of testimony at the Khmer Rouge tribunal on June 9, Kaing Kek Eav, the S-21 security center chief better known as Duch, said four Western prisoners of a group of nine were burned alive on order of his superiors. The former prison chief, now 74, is currently serving a life sentence for crimes against humanity handed down in a separate phase of the ongoing case. “I can say that they were interrogated and later on they were smashed, per the instructions — and the smashing here means they were burned with tires, car tires,” Duch said. While historians say an estimated 50 to 60 foreigners were killed at S-21 — many of them wayward fisherman hailing from Thailand, Indonesia, and Vietnam — the four that Duch immolated were part of a group of nine Westerners apprehended along coastal Cambodian waters in 1978. All appear to have been tourists who sailed off course or had the misfortune of randomly encountering Khmer Rouge rebels. 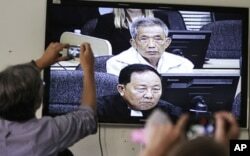 FILE - Journalists take photographs of a television screen showing the trial of Duch, former chief of the S-21 prison, at the Extraordinary Chambers in the Courts of Cambodia (ECCC) on the outskirts of Phnom Penh, Feb. 3, 2012. “They were arrested on charges of trespassing on the territories of Kampuchea in order to obtain information,” Duch said, explaining that the Americans, of whom there were four, were intercepted by navy forces along what is modern-day Preah Sihanouk province. "Later on they were sent to Phnom Penh … [where] the Central Committee sent them to S-21 to be interrogated and later on smashed,” he added. Youk Chhang, director of the Documentation Center of Cambodia, said nine Westerners jailed at S-21 included Americans James William Clark, Lance McNamara, Michael Scott Deeds, and Christopher Delance and Canadian Stuart Glass. He said others included Australians Keith Dean and David Lloyd Scott, New Zealander Kerry George Hamill and Briton John Dewhirst. “They killed all of them,” he said, referring to any foreigners incarcerated at S-21. 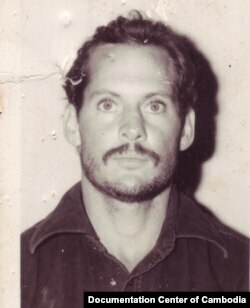 Peter Maguire, a law professor and author of Facing Death in Cambodia, said the deaths of the foreign prisoners in S-21 were well-documented. “[Duch] is probably very bored now that his trial is over and seems to have developed a taste for the spotlight,” he said.